JOYO Analog delay pedal offers the recognizable sound of the slap-back pedals. The new technology took the psychedelic rock scene by storm and transformed the possibilities of rhythm, play 1 note, hear 2, 3, 4 or more follow-up repeats. The JF-33 is about as simple as they come for Delay pedals, but don't think of this as a disadvantage. All you need to know is that the pedal is to be thought of as a piece of quantized gear and that since the controls are analog, you need to have some idea of how to recreate a sound once you've found it. This second setting, Mix at or under half, Time at max fastest bounce back and the Repeat all the way up or close, it a very useful and common setting to use for lead guitar, as when the ping sound is returned at anything less than 50 ms, you are barely if at all, able to hear a distinct note. There are so many tones possible, but two major categories: Slap-back single echo and dotted eighth or sixteenth note usually repeats. 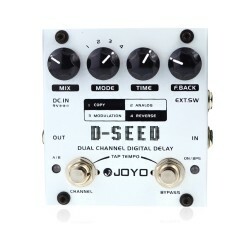 The Analog Delay from JOYO Audio an affordable device that inspires creativity and doesn't take too long to master, even provided that this is a new effect for you to experiment with. Guitarist Magazine putting the JOYO JF-33 Analog Delay guitar effects pedal through its paces..
"A very simple but useful piece of kit if you like a guitar with single coil pick ups lik..
JOYO JF-318 Quattro Digital Delay, aka The Quattro, like the name suggests, it has four modes of&nbs..